The Delhi unit of Congress party is vertically divided over any alliance with the Aam Aadmi Party, with the leadership leaving the decision to party president Rahul Gandhi. According to sources, Gandhi held a meeting with all top leaders of the Delhi Congress and discussed the issue with them once again, after having earlier decided to go it alone in Delhi. 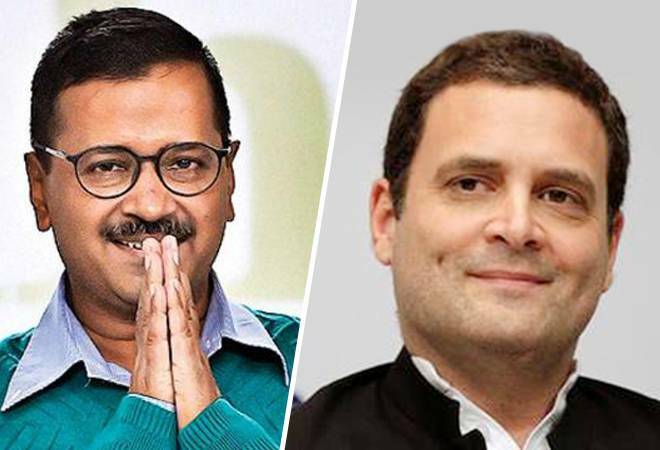 Sources said four former Delhi Congress presidents -- Ajay Maken, Subhash Chopra, Tajdar Babar and Arvinder Singh Lovely -- favoured an alliance with the Arvind Kejriwal-led party. Delhi Congress president Sheila Dikshit and three working presidents, Devender Yadav, Rajesh Lilothia, and Haroon Yusuf, maintained their stand against the alliance, they said. After airing their views to the Congress president, the party leadership in Delhi left the final decision on Rahul Gandhi. When asked in this regard, Congress chief spokesperson Randeep Surjewala said whether or not there will be any alliance in Delhi, "We will know soon". "As on today, no such call has been taken. What will happen in three hours or two days, I cannot today predict. "That is a leadership call that has to be taken by the Party and they will take so. Qua Haryana and Punjab, it seems unlikely. I can only say that much," he told reporters. Surjewala claimed that the BJP has lost 14 allies since 2014 and the Congress has already finalised its alliances in several states. The rethink on the Congress alliance with AAP in Delhi has come after intervention of opposition leaders like Sharad Pawar, who is asking both the parties to come together to unitedly defeat the BJP. The section led by Dikshit is vehemently opposing the alliance, while that led by AICC general secretary P C Chacko is in favour of a tie-up. The party has already decided to go alone in Delhi, but a rethink is on keeping political considerations in mind.